EarthVPN is a budget provider of virtual private network (VPN) services, offering a useful and reliable network for the money. The provider has 151 server locations in 32 different countries, so it’s easily possible to access blocked and censored sites and services in many parts of the world. EarthVPN does support all the major protocols, so long as they are compatible with Internet devices and offers safe and secure encryption for all data. It’s only possible to use one device with this budget service, but a variety of different upgrades are available at low costs, including adding more than one additional device. Offshore servers make EarthVPN a great choice for torrenting and P2P users and giftcards or BitCoin payment can be used to pay for plans so the customer can truly remain anonymous with the service. Any customers experiencing problems with their EarthVPN service in the first few days can claim a full refund within the initial 7-day period, so it’s quite a risk free choice of provider. Customer support is provided via an email ticketing system, although the FAQs and knowledgebase on the EarthVPN site do offer a wide range of detail and can solve many common problems for customers. EarthVPN provide setup tutorials for a range of different Internet devices including the iPad. Adding EarthVPN to an iPad is quite straightforward and just involves setting up and configuring the VPN on the iPad. Customers need to select General from the Settings menu and then tap Network. VPN should then be selected, followed by Add VPN Configuration. A number of entries then need to be made within the configuration screen, the customer first needs to input the desired protocol, for example PPTP. 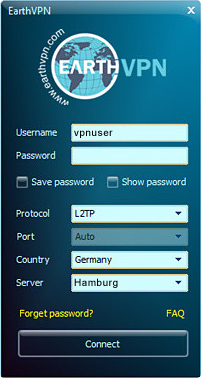 The description name should include a name for the VPN, for example EarthVPN. The customer will then need to access the EarthVPN website to find an address for the most appropriate server and this address will need inputting in the Server box. The correct EarthVPN password and username should then be entered within these fields, followed by sliding the Send All Traffic indicator over to the On position. The blue Save button in the top right of the screen should then be tapped so all configuration settings are saved to the device. The iPad will return to the General screen after this has been successfully completed and the customer will note that the EarthVPN details have been configured as the details will show beneath the VPN button. Testing the EarthVPN connection is just a simple matter of tapping the VPN On button and waiting for the device to access the virtual private network. Whenever the VPN is turned on the customer will be assured of private and secure Internet transmissions, both receiving and sending. Mobile Internet is notoriously insecure but with the VPN active every consumer can surf the net with peace of mind and transmit the most personal details with no fear of interception by eavesdroppers and hackers. When customers want to deactivate the VPN it’s just a case of sliding the VPN Off switch into place. When iPads go into sleep mode or lock screen mode they do disconnect VPN services, so the EarthVPN connection will need to be set back to the On position on a frequent basis. Adding the EarthVPN configuration to any iPad is easy and it’s just as simple to add EarthVPN to any other suitable device. Customers will need to change server locations if they need to access any popular sites that operate geo-restrictions, such as Netflix or Hulu in the United States or when they are travelling on a frequent basis.